I know that's it's a crazy time of year for an event. If you can't make this one, you can take it to go. 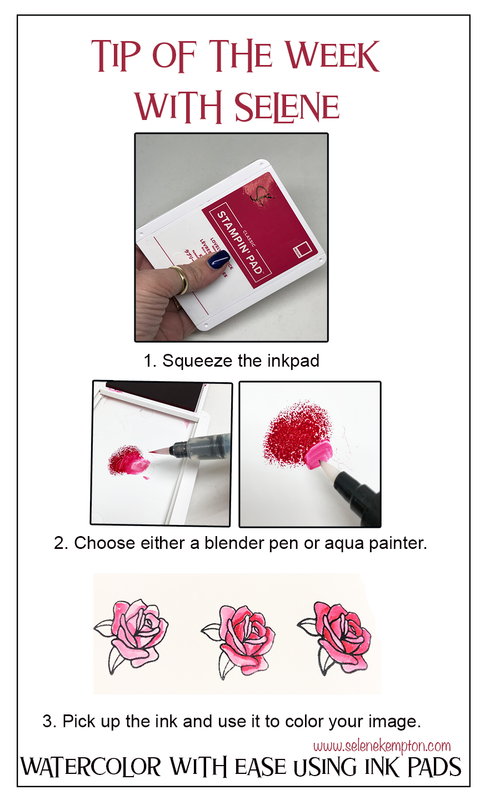 You will need your own stamps, One punch and your own ink to assemble if you take the to go kit. The complete shopping list will be out soon. If you come to this event, you could potentially knock a Christmas Gift or two off your list! Do you know someone that would like to get handmade cards for Christmas? Demonstrators from any team are welcome, customers are welcome, this event has something for everyone! 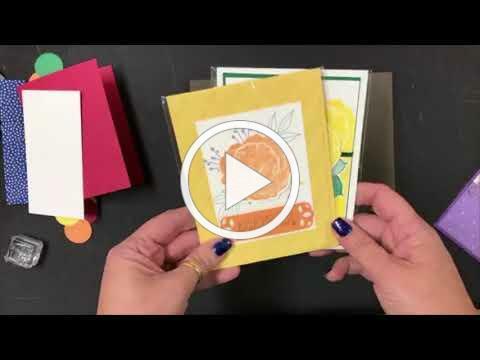 The cards are so amazing, you wont be sorry you took the time for a "Crafty Time Out!" during this time of year. Join us, the Stampers With HeART Team, on Sunday December 16th and make 16 BRAND NEW different cards using stamp sets and supplies from the 2019 Occasions Catalog and get to play with the new goodies. These projects are super prepped for you, so you can make them all in 3 hours! Get your catalog TWO WEEKS before it goes live so you can get your shopping list going! 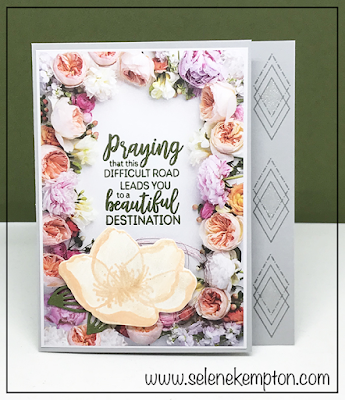 Be the FIRST to see the new STUNNING new designer papers, colorful embellishments, Big Shot framelits and punches that will leave you saying WOW!! If you are taking the class to go, you will need your own stamps, and ink to complete the projects. I'm thinking you will also need the piece of cake punch and butterfly gala punch. (more details to follow on that). This registration will close down Tuesday December 11th at midnight or when the packets have been depleted! First come first served, limited to 48 packets. Everyone receives two full embellishments, you keep the extras. 16 packets, with directions mailed to your door for $57 (includes shipping) Plus the PDF tutorial emailed by December 23rd. Your fee will also include 2 embellishments, you keep all the extras. 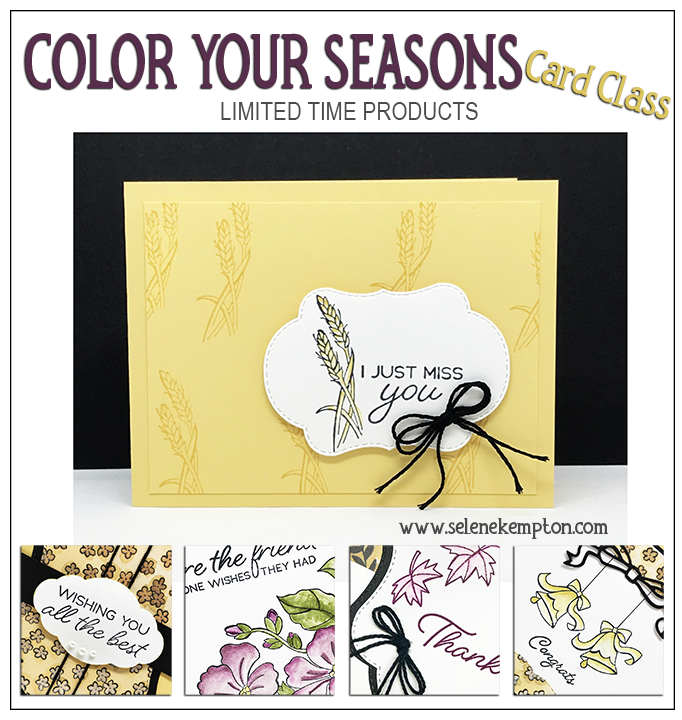 Plus, all supplies to complete the 16 different cards using at least 4 different BRAND NEW stamp sets! As with MANY stamping events there will also be stamping friends, and door prizes! Please bring adhesive and a refill to be safe and a covered bottle of water/coffee to drink. I will have adhesive for sale if you need it. I'll have some snacks. However, if you dont mind waiting till my team finishes cleaning up, we will be finding some place to head to dinner afterwards. I plan to stay and hang out afterwards if you'd like to have dinner together. I am SO excited about November's monthly class! For the FIRST TIME, I thought I wasnt going to be able to offer a class (we have a family vacation coming up!) I pushed this class two days early, so the November class is actually being held at the very end of October. This STUNNING and super elegant class is available in person, or shipped to your door! If you are taking the class to go, you'll need your own stamps and ink. Supplies you'll need are listed below on the event page. 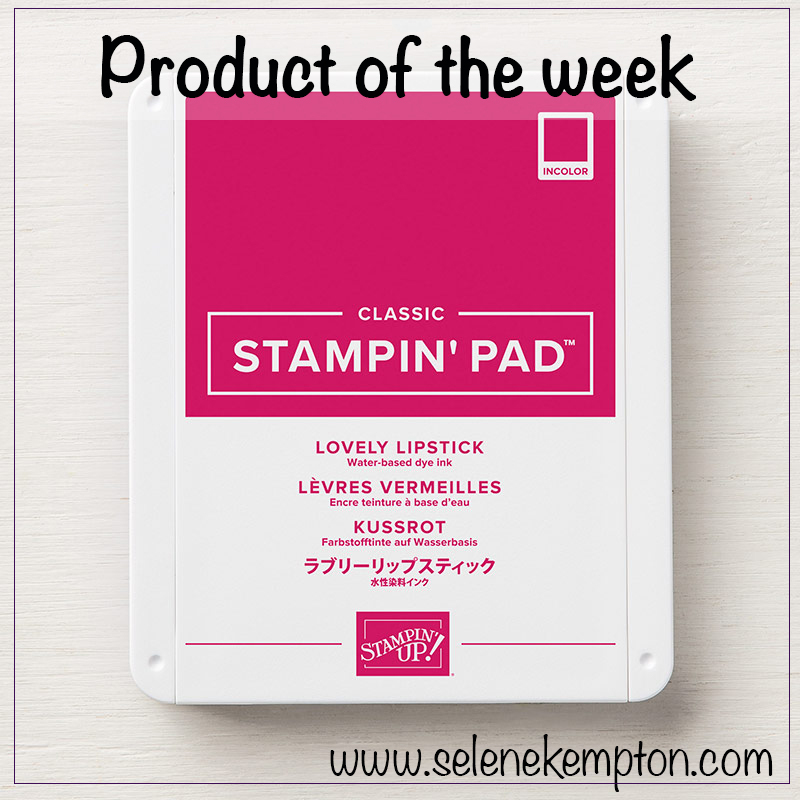 Include the stamp set and score a sweet deal! Get the Kit to Go: Same price $15 or waived with a minimum order. Email me for details or click here to visit the event details page. I really do miss you! 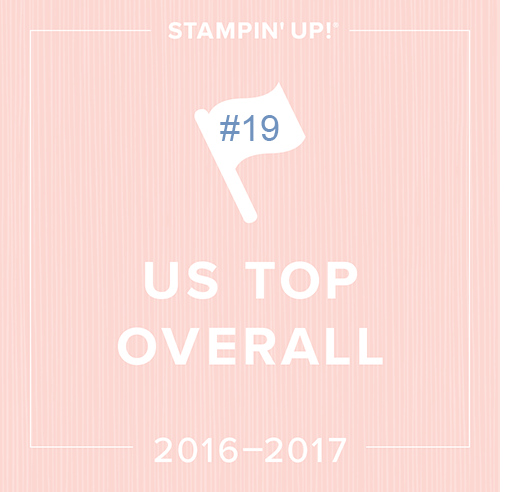 I have been away on the Stampin' Up! cruise to Alaska and we are on our way back. This GORGEOUS NEW, LIMITED QUANTITY Suite is will be available on Wednesday August 1 to order. All orders over $50 will also get a tutorial that's different from this month's class so you can continue to create with your bundle! 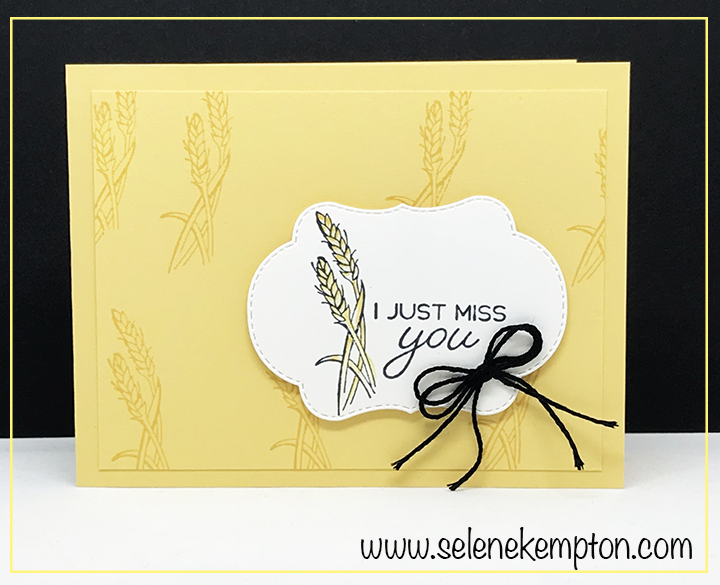 I just love that main element shape and see myself creating lots of fun cards with it! I can't wait to get home and spend some time stamping with my stamp club next week and this card will be part of my August Card class which features the blended Seasons bundle too!! 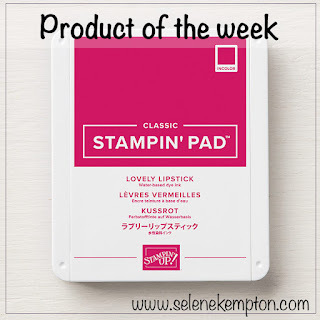 Product of the Week ~Stampin' Up Hostess Hand Delivered Stamp Set! 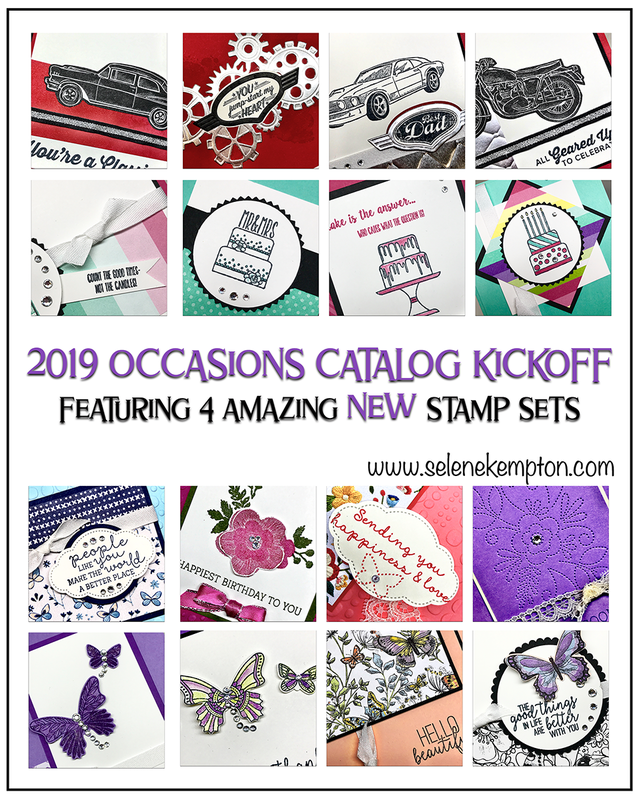 This host stamp set is normally only available with Stampin’ Rewards. If you love this stamp set, please be sure to visit here tomorrow for details on my Alaska Cruise Special! 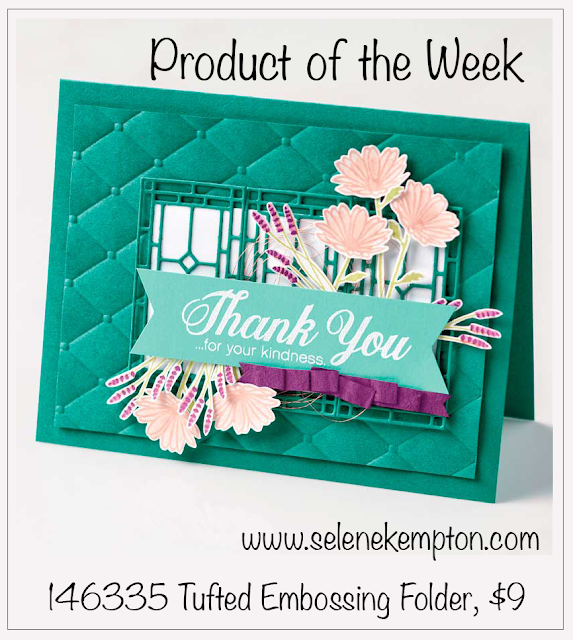 Tip of the week ~ Stampin' Up! Hand Delivered Stamp Set! I can't believe the day has finally arrived! I am off to Alaska with Stampin' Up! 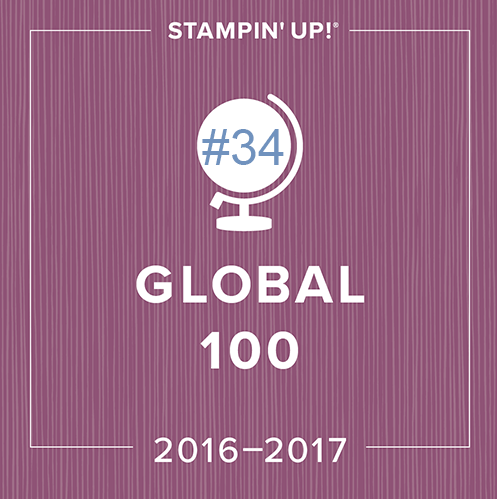 I am so very grateful to all of you, my friends, stamping family and team! I have a special just for you! To see samples with the AWESOME host set I have been collecting with my host benefits since the catalog went live, check out my Facebook Live Replay here. Plus!! You Can Double DIP! 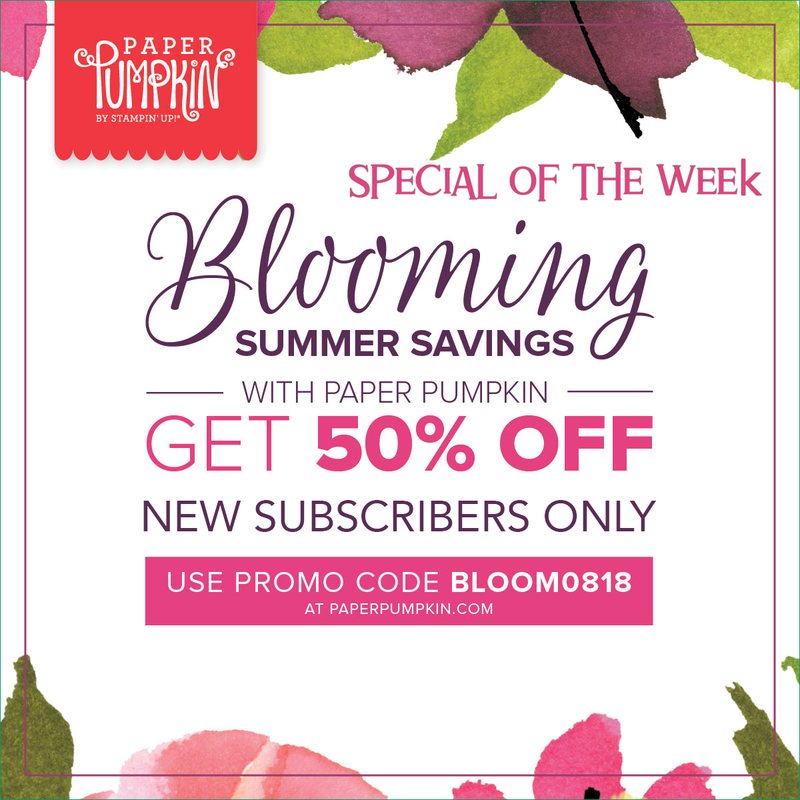 The Buy 3 Get one FREE designer series paper special is still going strong, Click here to check out that sale. 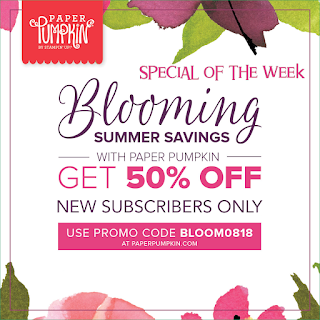 Get your free paper and the goodies from me with qualifying orders thru July 29th! Have a longer list? 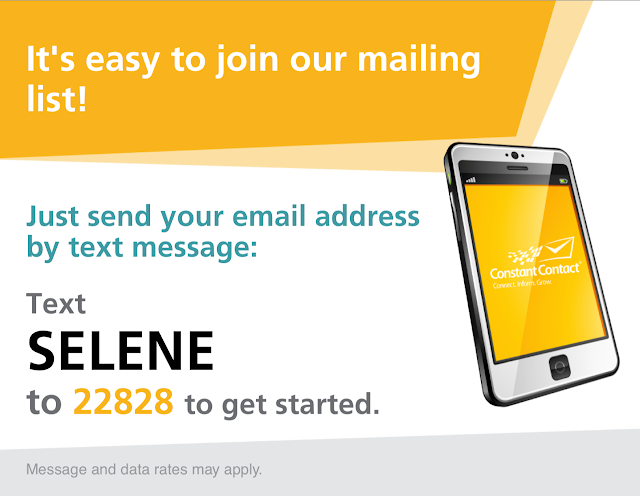 Click here to find out more about joining my team! Pay $99 for $125 (your choice in product). PLUS get 10 free ink pads! Thank you again! 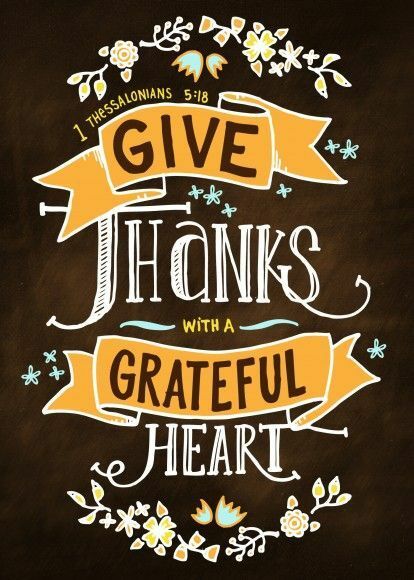 I am so grateful for you all! 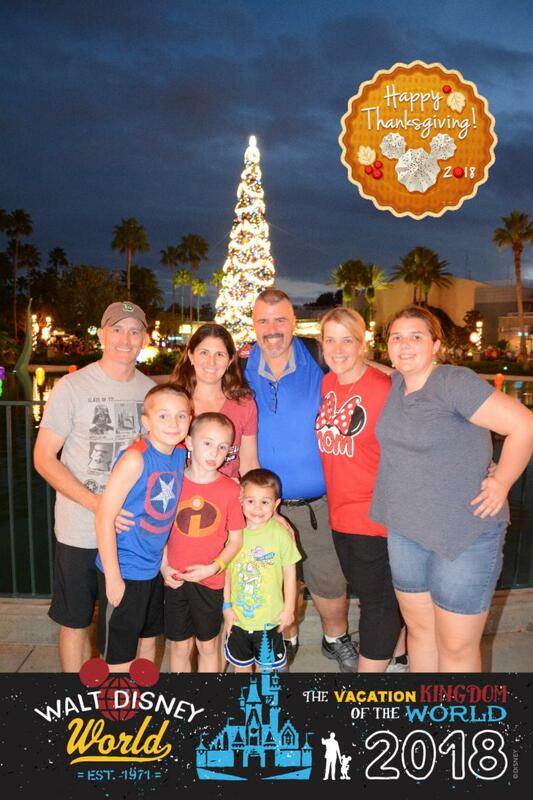 I am so grateful to be sailing away tomorrow on an all expense paid trip for TWO on Stampin' Up!, but it's really because of all of you! First! I have something for you! I have been saving the Hand Delivered Stamp Set, every time I get hostess benefits so that I would have enough for you! Second, I have an awesome video from today's live! Third, I have three free project sheets at the bottom for those who join my email list! (on the right). This week's travels has certainly led me and my family and I to an amazing destination, Alaska! This is an all expense paid trip that I earned for my husband and I. We are also taking my daughter and mom along! I am sure it will be the experience of a lifetime! This is a card I made for a friend who is going through a rough time emotionally. I really am praying she finds the road she is supposed to be on. 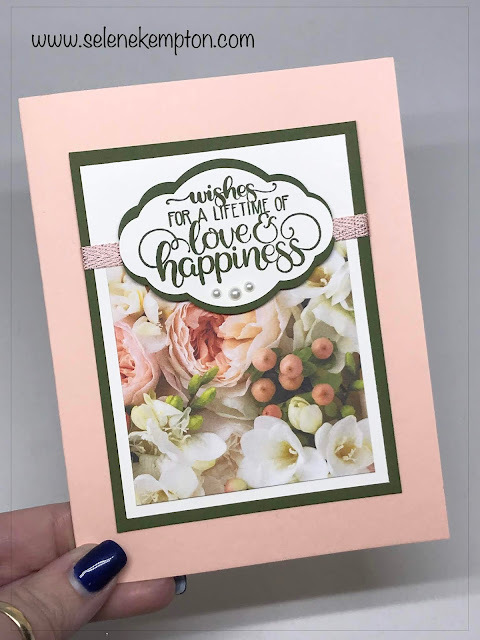 I stamped it with Petal Pink Ink, and used the big shot to die cut the flower out. I will be emailing the directions for FREE to my constant contact email list either this Friday (tomorrow) or next! (still working out the details before I leave)! Thank you so much for visiting today and if you are not on my email list you can sign up over on the right hand side bar, or you can use this text signup tool below so you don't miss a thing! 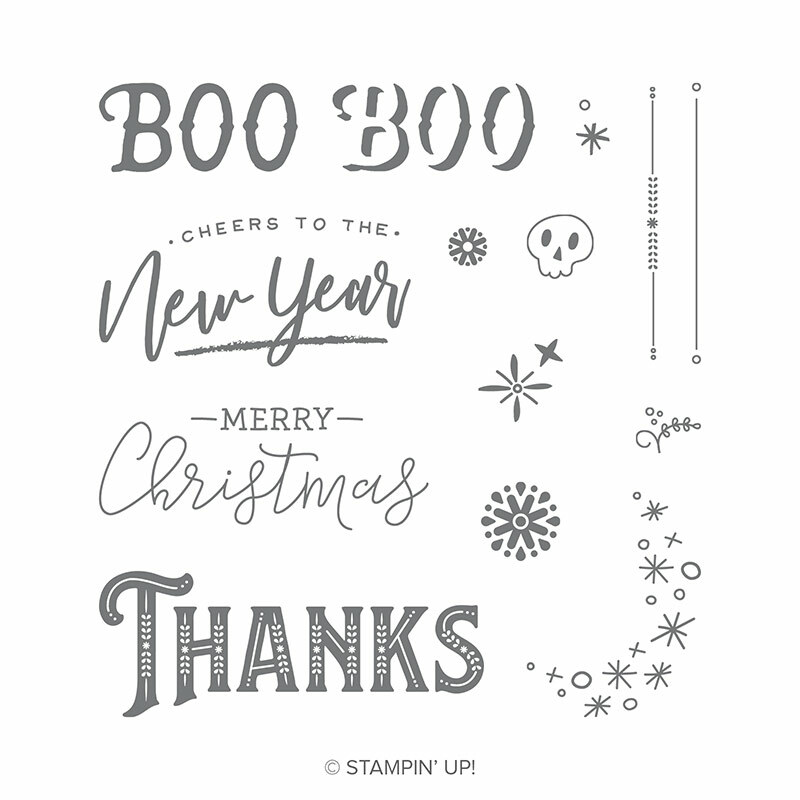 Thank you for being a part of my stamping world! My daughter Alexis (age 13) made a fabulous video of this month's paper pumpkin, then made up all the projects. Didn't she do a great job? If you are interested in trying it out, I told her she is better at these videos than I am, and I would give her the commission from anyone who signs up to get a kit this month! Isn't she talented for only being 13? I'm one grateful mom. Here's the link to get your kit at 1/2 price for next month! Product of the week is the Tufted Embossing Folder! Create a nice 3D effect with this embossing folder. If you need this one today, you can check it out in my store. 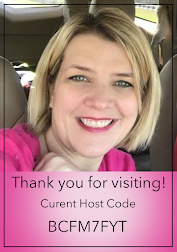 Please use the current host code for a surprise in the mail from me! I hope you are having a fabulous end of the week! I have some fun projects to share with you today from the Facebook Live at 1PM. If you missed it, you can catch the replay on youtube by clicking here. I will share photos of the finished projects below! Just a friendly reminder that today is the last day to place an order ($25 or more in merchandise) to get a free packet for the Broadway Bound card class mailed to your door! 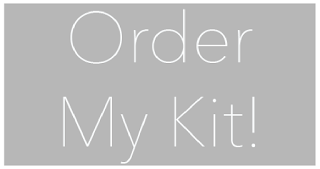 Need help placing an order? Just send me an email or call my cell. To sign up to order your class packet, click here. 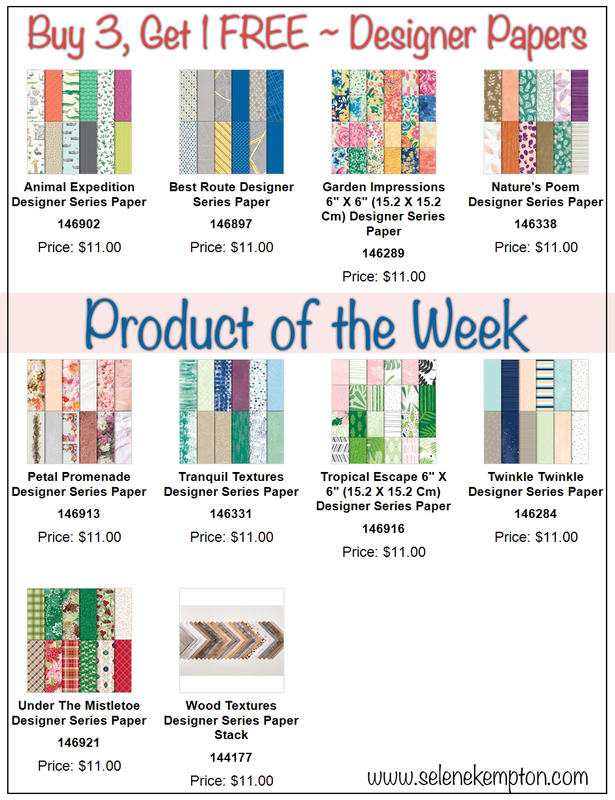 This week's featured product of the week is Designer Paper. It is featured in so many projects that I do! With new crafty friends, when they have trouble deciding what to order, I tell them to start simple with a few steps. 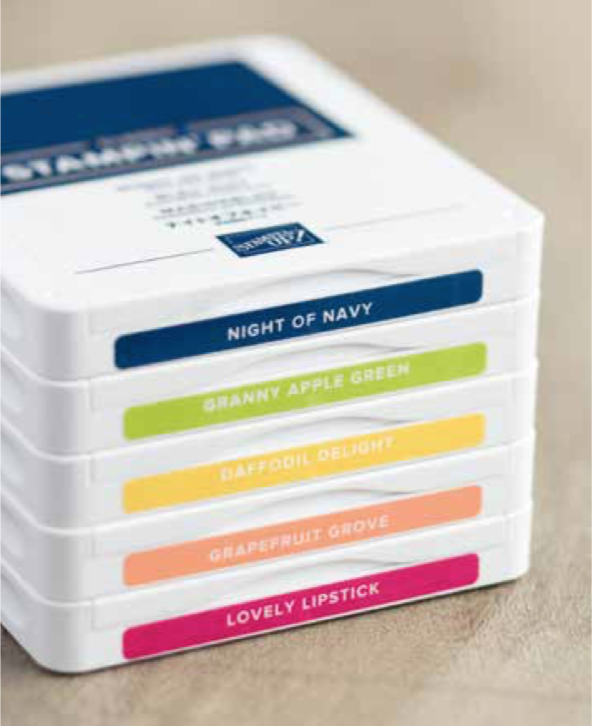 Pick a stamp set and coordinating Designer Paper that you like. Look and see what colors come in the pack. Order 2 of the colors and a neutral, meaning whisper white or very vanilla (to match). Don't forget envelopes and to look at accessories to match that kit! 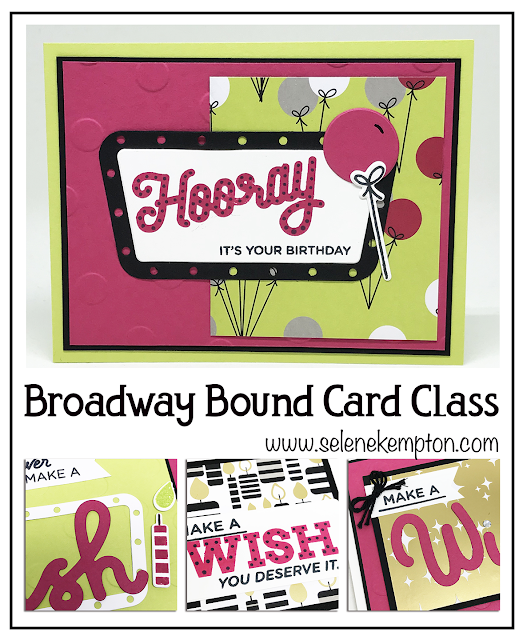 When you start with just one set of colors, everything you have matches and you can make a TON of cards! Below is a better look at what is on Sale! When you add these papers to your cart, the fourth paper needs to be separate for the computer to register what you would like. Keep that in mind when placing your order. So, how about more about this pretty card? Base: Petal Pink Cardstock 8 1/2" x 5 1/2", scored and folded at 4 1/4"
Layer 2: Mossy Meadow 4 1/4" x 3 1/4"
Layer 3: Very Vanilla 4 x 3"
Stamp with Mellow Moss ink on layer 3. 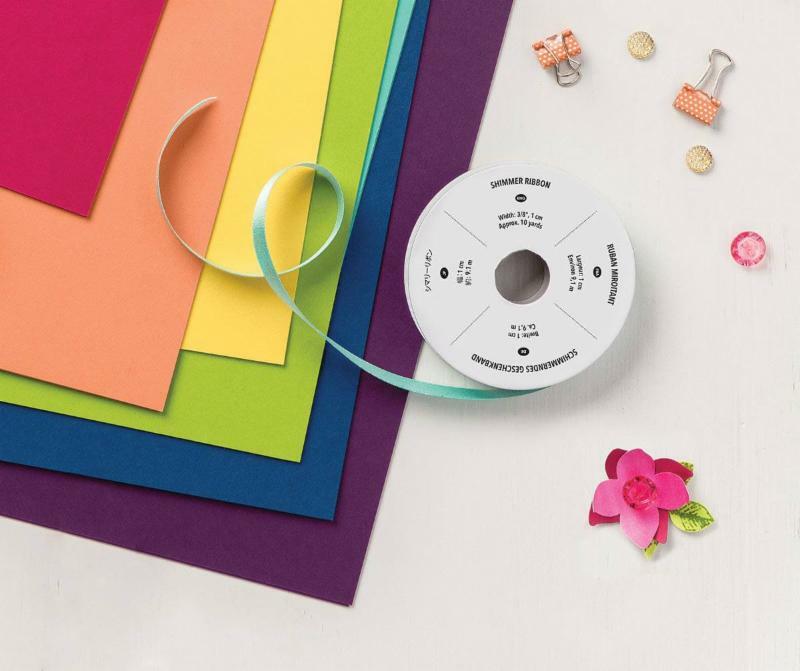 Use the pretty label punch to punch out the shape where you wont see it. Punch an additional pretty label punch out of layer 2. Use paper snips to cut in half the long way. adhere to layer 7. Then, add Stampin Dimensionals to the back. Adhere the rest of the layers together as shown above with snail adhesive and you are done! Here are the supplies I used! Thanks for stopping by today! 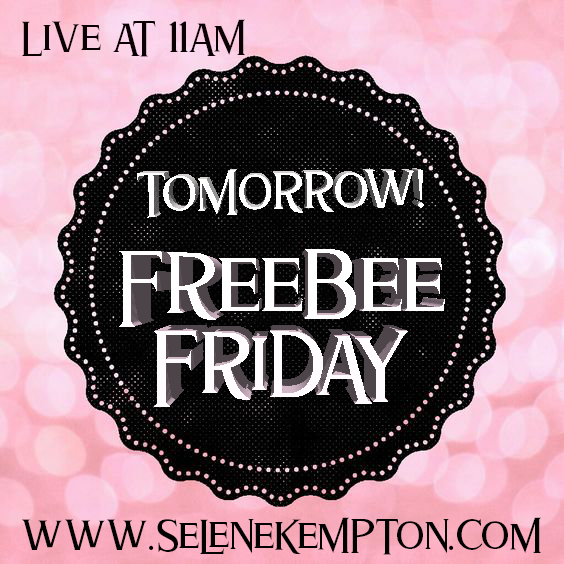 Join me Live tomorrow at 11am, or catch the replay here! 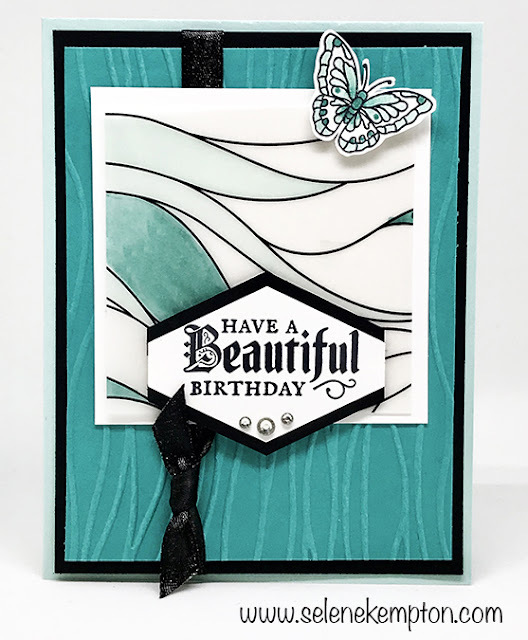 In addition, those on my email list will enjoy the video for a fun brand new product, as well as three free pdf's including this gorgeous card I made for my friend Chrissy's birthday! Be a part of all the fun! Join us tomorrow at this link! 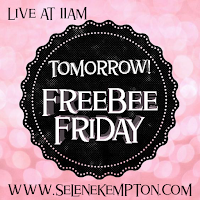 If you are not on my regular email list to get all the freebee's you can join here and get the three free PDF's today! Prefer to text? You can join on my text link instead! Isn't that fun? I hope you are spending your day with family and friends! 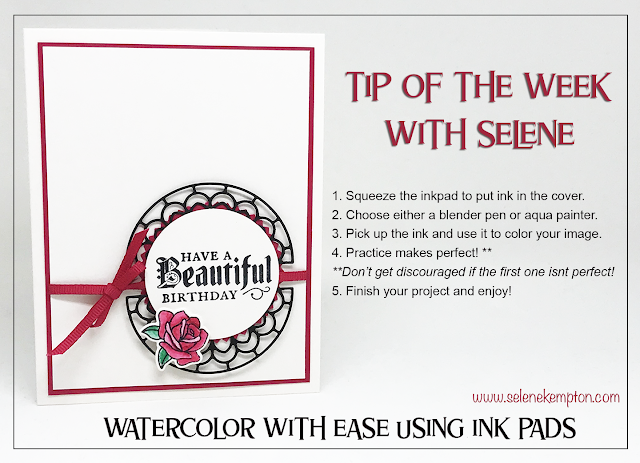 I have a quick tip for you today, to make this gorgeous birthday card! 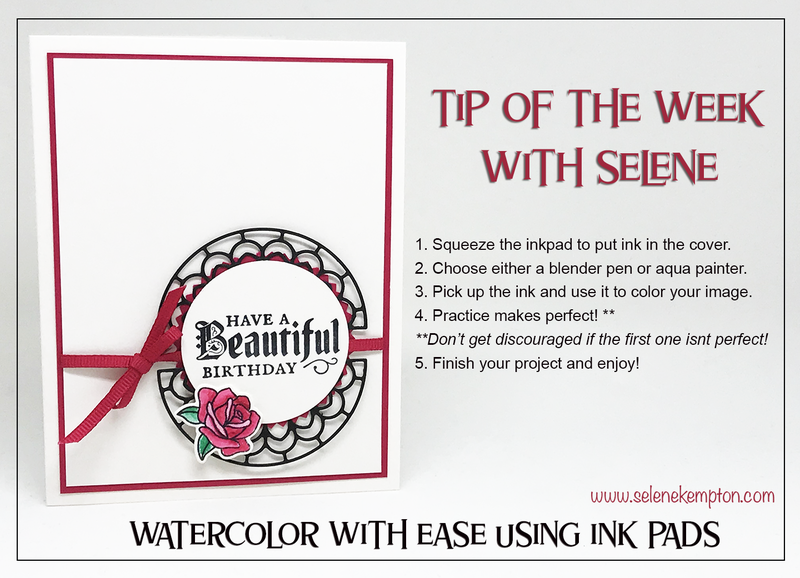 You can squeeze the your ink pads to put color in the lid and use an aqua painter or blender pen to color your images. Isn't that easy and fun? Here is a visual for you! Base: Shimmer White Cardstock, 8 1/2" x 5 1/2", scored at 4 1/4"
Layer 2: Lovely Lipstick, 5 1/8" x 3 7/8"
Layer 3: Shimmer White 5 x 3 3/4"
Layer 8: Watercolored Rose, using lovely lipstick and Shaded Spruce Ink Pads and die cut with the Big Shot. 1. Stamp the Flower on scrap paper, and watercolor as shown above. Die cut with the big shot. Add dimensionals to the back and set aside. 2. Adhere Layers 2-4 together. Tie the ribbon around and make a bow. 3. Finish adhering the layers using snail adhesive. 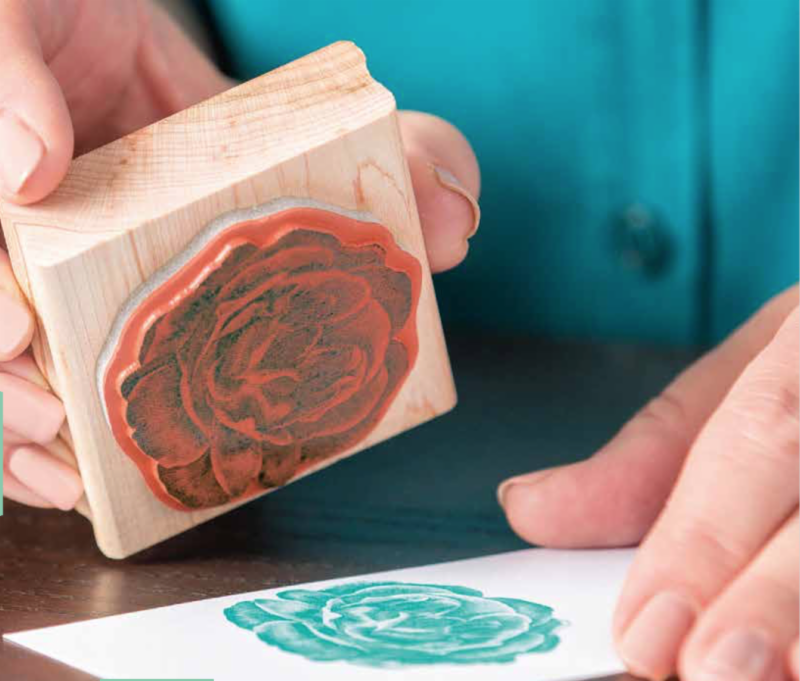 Use a dimensional to attach the watercolored flower. Enjoy! Need some stuff? Don't forget the product of the week on your order! Below is a complete list of supplies I used. Thanks for popping by today!